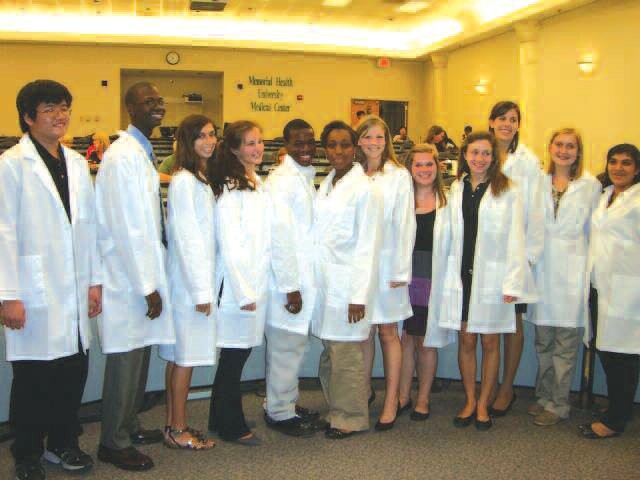 On Thursday, October 22nd, the 11th annual Memorial Medical Explorer Post White Coat ceremony was held for thirty six high school juniors and seniors from the Savannah Chatham Public High Schools. This partnership between Memorial University Medical Center, Armstrong Atlantic State University, Learning for Life and the Savannah Chatham Public School System gives youth the opportunity to do an indepth and on-going exploration of their chosen Career Pathway throughout the school year. The White Coat Ceremony marks the beginning of a year-long career development program consisting of presentations, demonstrations, basic medical skills practice, employability skills, hands-on activities, campus and worksite tours, presentations and demonstrations. Exploring, a subsidiary of Boy Scouts of America strives to be America’s foremost career and character education program for youth. Special thanks are extended to Memorial University Medical Center’s Susan Harper, Ph.D., Heather Scott and Garrick Throckmorton for organizing this year’s White Coat Ceremony, and to Dr. Martin Greenberg and Dewayne Cross, Pharm.D., for their participation in the ceremony. Many thanks also to Jacqueline Collander- Chavis, Chief Academic Officer for the Savannah Chatham Public School System for her participation, and to Gayle Tremble, Youth Apprenticeship and Workbased Learning Coordinator for the Savannah Chatham Public High Schools for her assistance in organizing this year’s program.